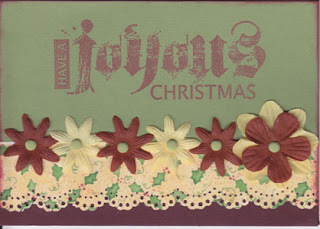 I am taking part in a challenge on the forum of Ideal Papercrafts. For five weeks we will be given a challenge to made a Christmas card. Great way to get started on this years cards for giving to family and friends. Here is my card for Week 1 - we were given the challenge to have a "collection of something" on our card. I chose to have a collection of flowers - five of them are the same style and size. I love your fonts Anne-Marie. Fabulous card.